Now includes the Off Road Support Brace for extra stability on rugged terrain. "I tried the standard screen, with triumph adjusters, then I tried the triumph accessory screen... no better. I bit the bullet and ordered the Madstad screen. Seriously, the best modification I've ever made, to any bike, ever! And I'm someone who likes to liberally farkle up my bike. - owned approx 30 bikes in the past 20 years. Can truly cruise along with the visor up now - absolutely NO chance of that with the standard / or triumph adventure screen. It is SOOO much quieter on my bike now - it's unbelievable." "Just a quick line to say how pleased I am with my Madstad screen. You were right in saying a 20” screen is more than tall enough for someone 6’2”. I have it set about the middle and it can probably go lower. I am well pleased with the results." "I tried on no less than 6 different screens on my Tiger 800 and finally put back the Madstad on the bike. No other system provided the kind of wind protection and "quiet" as did the Madstad." "Many thanks for your assistance and prompt despatch of my screen, arrived safely and fitted within 30 mins, still need to fine tune but WOW what a difference this makes to the riding comfort / quietness / no buffeting, it's a superbly engineered piece of kit and works brilliantly. I have already told my friends and posted on the Triumph 800 forum, how good this screen is, compared to the Stock and Triumphs Touring screen, both pretty useless!! A tad expensive, but I guess you get what you pay for, this WORKS!!!" 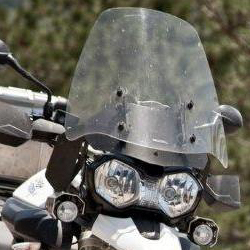 "Recently fitted a Madstad screen to my Triumph Tiger 800 XCA, it works superbly! 100% better than the factory one. Big plus is the reduction in wind noise and the amount of bug-splat on your visor! Very impressed with speed of service from HPS, delivery and ease of purchase. Fitting was slick - good piece of kit." 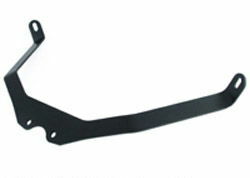 "Finally ordered a Madstad screen for my Triumph Tiger 800. It was delivered two days after ordering, and I fitted it the same day. Now there is no brain-rattle that I suffered with the original screen, due to turbulence, and no wind noise at all. I could happily wear an open-face helmet now. Well pleased with my purchase, and great service from HPS." Your kit will include everything needed, including the easy-adjust Robo Knob brackets for simple and quick positioning of your shield. !quote, screens, 800xr, 800xrx, 800xrt, 800xc, 800xcx, 800xca, xr, xrx, xrt, xc, xcx, xca, 11, 12, 13, 14, 15, 16, 17, 2011, 2012, 2013, 2014, 2015, 2016, 2017, xc800, 800xc! 80+ mph visor up in calm air. Also no more cold hands. Have had to buy a pair of summer gloves to stop hands overheating! Many thanks for the service and the product! Optional upgrade for those that do a large amounts of off road touring or ride on frequently bumpy terrain. This stainless steel support braces the top of our mounting plate to the frame of the bike, down behind the headlight assembly. 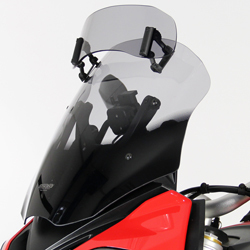 It provides added rigidity for the entire windshield system. 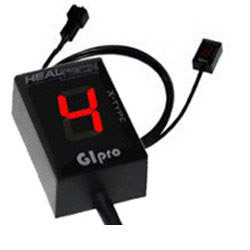 Customers have also reported this is handy for mounting your SatNav too. !sat, nav, sat-nav, satellite, navigation, gps, attach, offroad, off-road, mount!